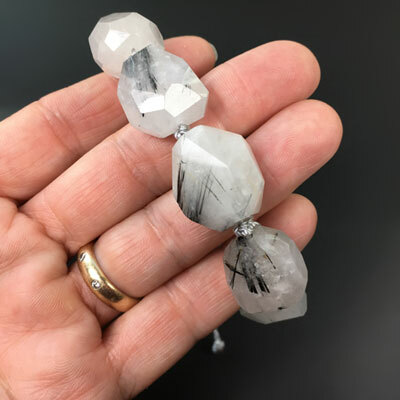 Tourmalinated white quartz is quartz with embedded black tourmaline needles. The beads have faceted sides. The bracelet is knotted and braided with light grey nylon cord. One size fits all. 7 beads knotted with nylon cord. Beads 16-18 mm wide, by 17-21 mm long. Sliding closure, adjust to wrist size.